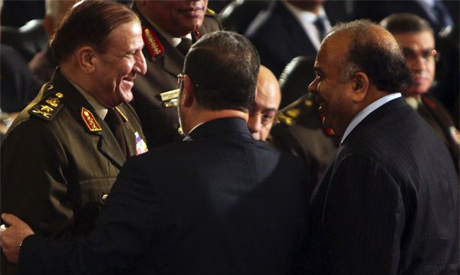 Speaker of Egypt's dissolved parliament Saad El-Katatni on Sunday evening met with Lieutenant-General Sami Anan and other members of the ruling Supreme Council of the Armed Forces (SCAF). In a statement following the meeting, El-Katatni declared that the SCAF’s recent order to dissolve Egypt's Islamist-run parliament was "unconstitutional." El-Katatni went on to call on the SCAF to "preserve the democracy that was realised by Egypt's January 25 revolution and respect the will of the people." On Thursday, Egypt's High Constitutional Court declared Egypt's Parliamentary Elections Law – which regulated last year's legislative polls – to be unconstitutional. The SCAF subsequently ordered the dissolution of the People's Assembly, the lower house of Egypt's parliament. El-Katatni, who is also secretary-general of the Muslim Brotherhood'sFreedom and Justice Party, went on to tell SCAF members at the meeting that Egypt's Constituent Assembly – tasked with drafting a new constitution – represented an "independent entity" according to Article 60 of last year's Constitutional Declaration. El-Katatni went on to assert that assembly members planned to hold their first meeting "within hours."